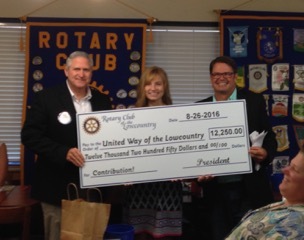 Rotary Club of the Lowcountry presents a check for $12,250 to United Way of the Lowcountry. Left to right: Rotary Club of the Lowcountry President Alan Beach, United Way of the Lowcountry President & CEO Tina Lamb Gentry, Rotary Club of the Lowcountry Past President Jeff Althoff. Committed to the Beaufort community, Rotary Club of the Lowcountry raises thousands of dollars each year which is reinvested in numerous non-profits supporting a variety of programs including anti bullying, homelessness, domestic violence and Alzheimer’s research.